Christina Milian has seen a career in showbiz which she started as a young girl grow to the point that she is today been mentioned among the very best in the entertainment industry globally – notable as both an actress and music artist. In as much as she has received a lot of awards and praises for her works, she has also received a lot of criticism. More so, her love life has been in shambles yet she has been a loving mother to her daughter. Here is everything you should know about her. The actress was named as Christine Fores at birth but she took up her mother’s maiden name, Milian, with hopes of landing bigger roles in her career. She was raised in Waldorf, Maryland and was born in Jersey City on September 26, 1981. She is the eldest of three girls born to Don Flores and Carmen Milian. Her sisters are Danielle and Elizabeth and she identifies herself as a Cuban American. At age four, Christina picked interest in showbiz. Her supporting parents who saw the talent in her helped her to pursue the career at that tender age and by the age of nine, she had become the brand face of many commercials and ahd also featured in small movie roles. It all looked like her career was not really blooming in Waldorf, so her mother, who was determined to help her child attain the very best in the entertainment industry thought it wise to move to Los Angeles in order to achieve her intents. As a result of this, she lost her darling husband to a divorce, who chose rather stay back in Waldorf. As expected, Christina’s dreams began to unfold as they got to Los Angeles. She landed her first role in the Disney world where she hosted the series, Movie Surfers (1998). Subsequently, she realized that she also had an interest in music, got herself acquainted with Rodney ”Darkchild” Jerkens. With him, she grew her musical career and also did some recordings. Also, during this period, her fame skyrocketed in the industry and she also got to meet other already established persons in the industry. Christina got her big break after she featured in Ja Rule’s Track, Between Me and You, it was with that song that she attracted Def Jam Records who signed a deal with her. That song topped as the number 11 spot on the Billboard Hot 100. The following year, she collaborated with JLO and also co-wrote her song, Play. She later released her first self-titled album. However, the Europeans were the first to get the feel of the album, as at the time it was released, the US was in the distress of the 9/11 attacks leading to a poor reception in the country. Despite that, the album topped as the 23rd spot on the UK charts, selling over 101,000 copies. Also, her singles “AM to PM” and “When You Look at Me” on the album were top chatters worldwide. Afterward, Christina Milian moved on from the Def Jam Records and released her second album, It’s About Time with the Island Records. One of the album’s single, Dip It Low, was said to be the best in the entire compilation. It was praised by many and was also compared to the song rhythm of the likes of Jennifer Lopez and Beyonce. The single topped as number 2 spot on the UK charts and it also announced her as the Best Rap/Sung Collaboration in that year’s Grammy Awards Nomination. After the release of that album, Christina Milian decided to change her looks and lightened her hair. Having attained such tremendous progress in the music world, she decided to focus on her acting career and got her first lead role in the comedy movie, Love Don’t Cost A Thing (2003). After that, she later played a role in Be Cool (2005) and Pulse (2006). Trouble began in paradise for Christina in 2006 as the Island Records decided to drop her after the release of her third album, So Amazin, that year. The album was one of the poorest sold album that year as it sold only 163,000 copies. Ever since then, she has struggled to get back on her feet, sources say she has recorded a few albums that are yet to be released. Currently, she has decided to tread the path of an entrepreneur and has played as a host in a few television reality shows. Aforementioned, Christina Milian was born to Don Flores and Carmen Milian. She plays big sister role to her two younger sisters; Danielle and Elizabeth. 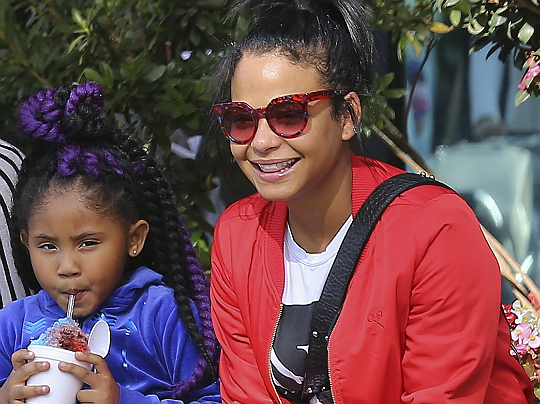 With regards to her personal life, Christina Milian has been in a lot of relationships. She dated Nick Cannon after they met on set in 2003. Their relationship was heavily publicized but they couldn’t keep up the pace with each other and called it off after two years and half of being together. Next, she moved on to date The Dream – a musician. Ab initio, it all seemed like he would be her forever mate, the two got engaged and got married in 2009 somewhere in Rome. Soon their union was blessed with a baby girl named Violet Madison Nash. Unfortunately, the couple got divorced that same year they tied the knots. Shortly after that, the actress started to date Jas Prince. Like every of her other love tango, this also came all crumbling down. It was later rumored that she had a fling with the rapper, Lil Wayne. Currently, she is said to be with the French singer, M. Pokora. Looks like the actress’ net worth drops every year instead of growing as the years roll by. In 2017, she was estimated to be worth $7 million but as of this year, her net worth falls at $4.5 million.